Sport shoes, especially if you use them intensively, can get very smelly. Find out how you can rid of that nasty smell naturally. Depending on how bad smell of your shoes is you can add or skip some steps in the process. Such measures will be marked as optional and you can add or skip them as you want. Optional: Pour Hydrogen Peroxide on your sneakers and let it work for 30 minutes. Dissolve 1 Tb spoon of detergent and ½ cup of baking soda in warm water. Because we are talking about natural means to odor control, think twice about what detergent you use. As many of conventional detergents contains fragrances, which can cause allergic reactions and phosphates, which are dangerous for environment. So “be the change…” as Gandhi said and switch to natural detergent. You can buy them at any store now. I, personally, use one from Seventh Generation. There are near hundred uses for baking soda, so don’t overpay for little boxes of baking soda in grocery aisles. Buy in bulk instead. I buy mine in 13.5 pound bag at Sam’s club. Optional: Take an old toothbrush and scrape your shoes, as long as your patience will go. Squeeze out as much water as you can and hang it to dry. 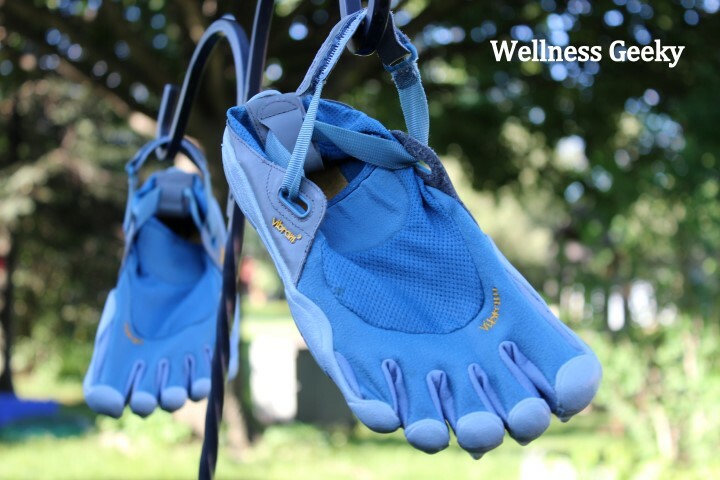 The best way to dry your athletic shoes is outside in full sun, if weather permitting. Ultraviolet in sun rays has antibacterial effect and can also kill odors. Understandably, not all of us live in Florida and California, and it’s not the fastest option to dry shoes when it’s freezing temperatures outside. However, many shoes manufacturers not recommend putting shoes in the dryer as the constant motion and heat can cause damage to them. In this case you can use special mesh bag which can be attached to the door of dryer and use low heat dry cycle. It will be better than to let your shoes dry at low room temperatures. The longer your shoes will stay wet, the more chance you give bacteria to grow and to cause smell. And what are your tricks to keep your shoes smell nice, share below?